The Brockville community has come together wonderfully to present this epic musical as part of their rememberance ceremonies. The brain child of writer AJ Benoit, the show is being produced by the royal Canadian legion branch 96 Brockville, in association with the Brockville Theatre Guild, Brockville Operatic Society, the Brockville Rifles, and the city of Brockville. 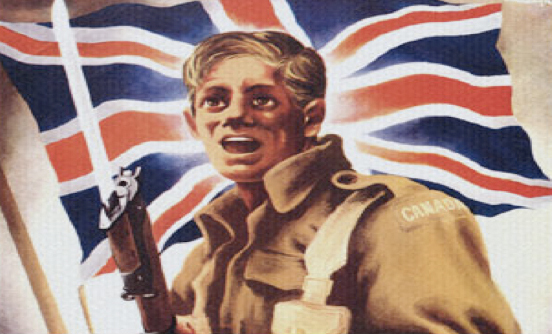 Building on the success from last November’s sold out, 5 person troupe music review of “Bless ‘Em All”, a journey from 1939-1945, The Royal Canadian Legion Branch 96 is proud to present the “Musical” version of the show! This Canadian written musical features the show’s writer A.J. Benoit playing the part of “The Sgt. Major”. Niki Houldcroft, Ainsleey Worden and Lee Anne Frederickson play “The Andrew Sisters”. Mary Ross-Comstock, a Performing Arts Hall of Fame Inductee is the Music Director conducting a cast of over 30 actors to include local celebrities! You will find yourself singing along throughout the show as it features many of the old favourite WWII songs such as “Kiss Me Good Night Sgt. Major”, “We’re Gonna’ Hang Out The Washing On The Siegfried Line”, “The White Cliffs of Dover”, “The Nightingale Sang in Berkley Square” and many more. The show is part of the Brockville Remembrance Commemoration Ceremonies leading up to November 11th. All proceeds from this show will be donated to the Brockville Royal Canadian Legion assisting them in providing the many services they offer in the community to include “Promoting Remembrance”. Written by AJ Benoit feautring classic music from WWII.